When the sun sets, you have to stop riding. Wrong! You just need to know how to stay safe when riding at night and in low light environments. Thanks to LED technically, the brightness and range of bike lights has really increased. You can pick up a bike light reasonably priced, that will do the job. If you are riding in places with no street lights at night, such as rural roads, we encourage you to have a bright enough light that you could see potholes, animals or any other obstacles. Also, remember to keep your lights charged or carry a spare set with you. 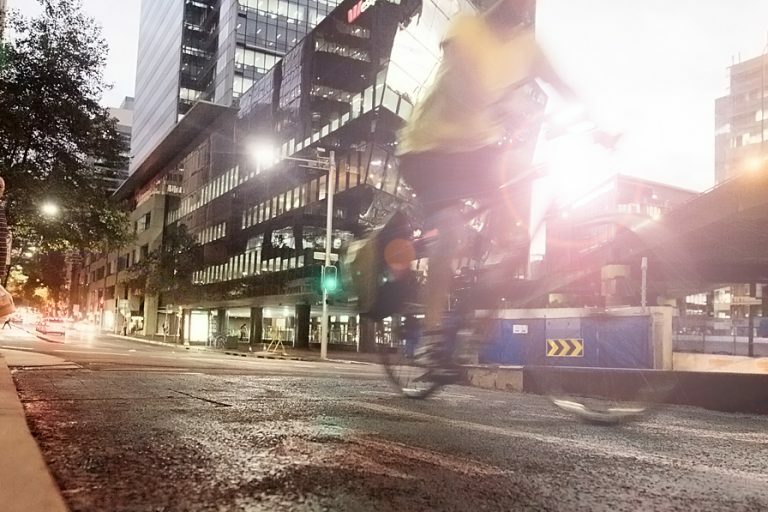 We recommend wearing reflective clothing when riding at night. This can include: top, pants, gloves, shoes etc. You can also get reflective stripes to add to your bike, i.e. on the pedals, mudguard, saddle. Bicycle NSW Members can purchase these through our partners at monkeysee and Bicycle Safety Equipment. Visit our Members Benefits page to find out more. Having an issue with your bike is bad at the best of times, in the dark it’s worse. We recommend you have done a pre-ride bike check before riding. Also carry tools and equipment (and know how to use them) in order to fix your bike. We recommend cycling the route you’re planning to ride at night, during the day. This is to make sure you know of any challenging spots and can handle them in the day – they can often be more difficult at night. Having additional bike riders around you when cycling at night further increases your visibility to other road users. There are more eyes to look out for hazards on the road, more bikes for other road users to see and more hands to lend when mechanical problem happens.